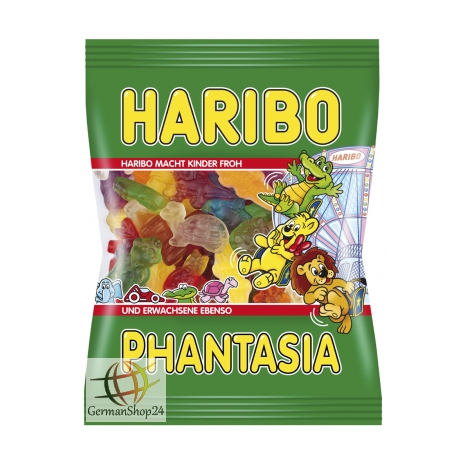 Haribo Phantasia is the most "phantastic" mixture of gummy candies and marshmallow gums. Where else would you find delicious flying pigs, yummy bunnies emerging from the wizards hats as well as classic favorites such as little devils or coke bottle gummies? There is something in this bag for everyone - fruit gum and marshmallow lover alike! Glucose syrup, sugar, gelatin, dextrose, citric acid, fruit and plant concentrates: apple, safflower, spirulina, radish, lemon, carrot, sweet potato, blueberry, black currant, hibiscus, flavoring, caramel syrup, glazing agents: beeswax white and yellow, carnauba wax, invert sugar syrup. 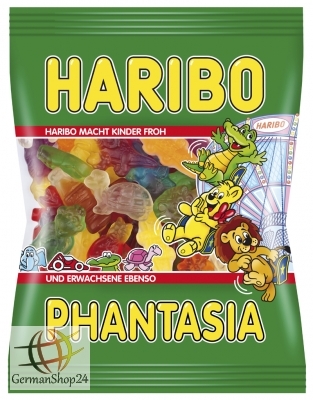 Glukosesirup, Zucker, Gelatine, Dextrose, Säuerungsmittel: Citronensäure, Frucht- und Pflanzenkonzentrate: Apfel, Saflor, Spirulina, Rettich, Zitrone, Karotte, Süßkartoffel, Heidelbeere, Schwarze Johannisbeere, Hibiskus, Aroma, Karamellsirup, Überzugsmittel: Bienenwachs weiß und gelb, Carnaubawachs, Invertzuckersirup.